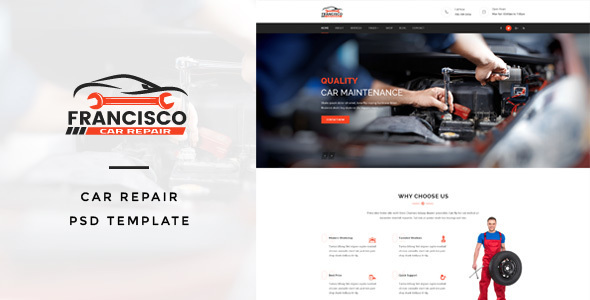 Francisco : Car Repair PSD Template Created by ifathemes. This templates have specific characteristics, namely: Francisco : Car Repair PSD Template suitable for all types of Car Repair Companies. That Includes totally 16 . You can use this Francisco : Car Repair PSD Template on Psd templates category for Car Repair, car service, Francisco, Spair Parts Shop and another uses. Francisco : Car Repair PSD Template suitable for all types of Car Repair Companies. That Includes totally 16 Pages. Towy – Emergency Auto Towing and Roadside Assistance Service WordPress theme.